Beautiful, custom "Majestic" model features gorgeous Engineered HARDWOOD in Dining Room, Great Room, Master & 2 Guest Bedrooms, tile in all wet areas- no carpet! 10 CEILINGS throughout home are fabulous and add to the spacious feeling. Great Room plan boasts French atrium doors onto screened lanai and split bedrooms for privacy and quiet relaxation. Bright-open Kitchen offers copious cabinets with pull-outs, great counter space & wonderful Breakfast Nook with 4 bay windows to welcome the sunrise every day. GAS range, NEW REFRIGERATOR & MICROWAVE, decorative display shelves too. Spacious 15x15 Master Bedroom features eyebrow transom window, access to screened/vinyl lanai via French doors, 2 large walk-in closets (6x9 & 6x11). "Ensuite Bath with large shower, dual raised counter top, large linen & slider window for crisp, fresh air. 2 large Guest Bedrooms also feature eyebrow transoms & large closets. Guest Bath with raised counter, tub/shower combo, additional transom window and linen closet nearby. Laundry Room complete with WASHER & DRYER (gas), laundry sink and cabinets. DOUBLE PANE/DOUBLE HUNG WINDOWS are a great bonus along with NEW ROOF (6/2018), NEW 14.5 SEER Lennox HVAC (2017) and EXPANSION TANK on Water Heater. Garage is 24x22 and includes fabulous built-in wood shelves, 10 ceilings, side access door and even a freezer! Separate irrigation meter, ceramic coating on stucco, manicured lawn & landscaping and termite bond included. 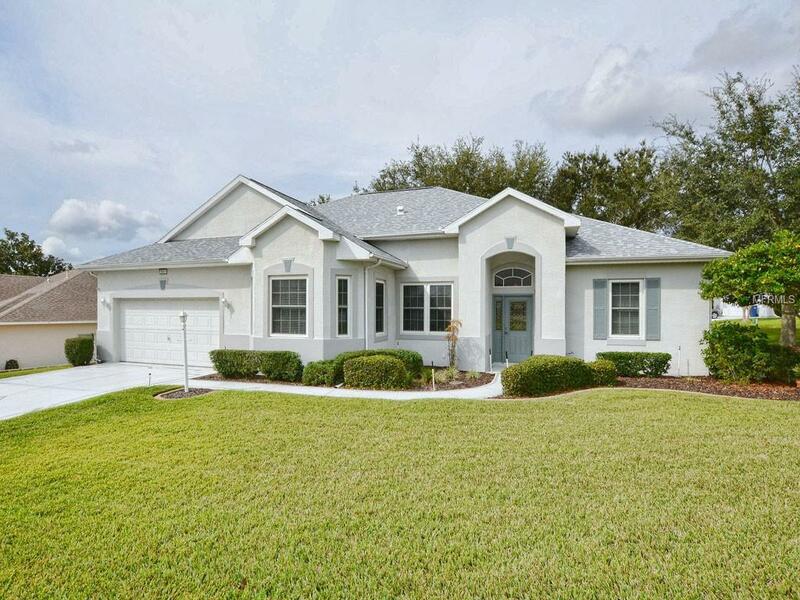 "Royal Harbor" on the shores of Harris Chain of Lakes, gated 55+! Additional Lease Restrictions See Ded Restrictions 55+. Pet Restrictions See Deed Restrictions Leash & Clean Up.